Automated home in India and Automated home solution is a small step to achieve this goal and is becoming integral part of our life. Imagine a single button for you to control. Automated home in India applications not know all person about its features. Automated home solution now became famous in metro cities in India. The big question however is what does it takes to make a home a "smart home". There are many products avialable in the market which are in the forms of KITS or SETS which are as simple as plug and play devices. 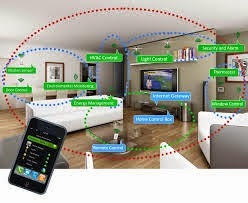 It will have a central hub through which all the devices are connected and shall communicate. There are many such products and for each product the price will vary based on the features and nodes that are installed. But the cost will range from 15K to 50K for standard kits while of-course the upper limit can go as high as 3L INR.